This weekend brought some of the best Street Fighter V players in North America to Boston to compete in one last Pro Tour event before Capcom Cup next month. While there wasn’t a whole lot on the line for many of the attendees, the matches still proved to be fast and furious, with one notable veteran falling victim to a young upstart in one of the most surprising ways possible. Justin Wong, a fighting game community legend, found himself on the wrong end of a thrashing at the hands of Derek “iDom” Ruffin. iDom doesn’t stray from New York City locals to compete at major events that often, but when he does, he tends to shine—at Defend the North in July, he beat Victor “Punk” Woodley, who is arguably the best Street Fighter V player in the United States. 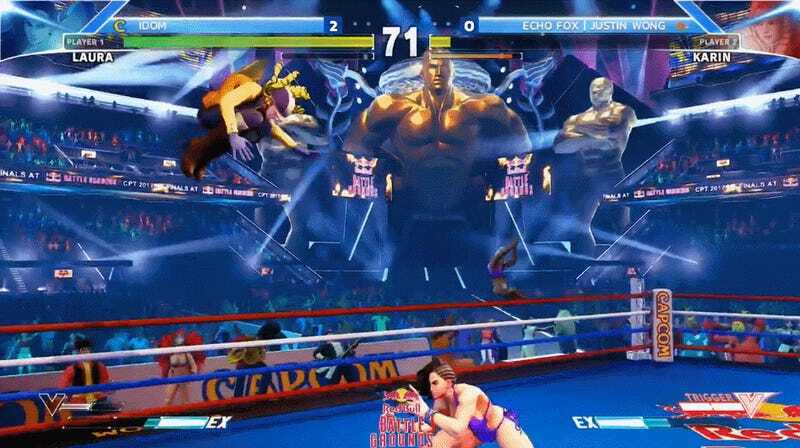 Upon improving the score to 2-0, Ruffin showed just how much space he was taking up inside of Wong’s head by landing six straight Sunset Wheels, a special move that’s unique to his main character, Laura. He won that round with a single attack, going on to take the entire set by a score of 3-0. The fighting game community would say that Wong was “mindfucked” in this situation, or so shocked by Ruffin’s choice to continue his single-move onslaught that he wasn’t able to come up with a viable counter-strategy. Sunset Wheel is a special kind of attack known as a “command throw.” Like normal throws, command throws can’t be guarded by blocking, but they differ in that they’re performed with a special input (in this case, a half-circle backwards on the joystick) rather than a combination of buttons. Oh, and the opponent can’t break them with a throw of their own. Command throws are typically harder to land than their regular counterparts, though, so the Sunset Wheel isn’t just an example of a overly powerful attack. Ruffin’s match against Wong was the perfect showcase of just how debilitating it can be to face off against a strong Laura player. Ruffin is a relative newcomer to the world of Street Fighter competition—but, then again, everyone is when compared to Wong’s decades of experience. Still, Ruffin’s victory highlights the steps he’s taken to excel in Street Fighter V, using the tools provided to make even a fighting game legend second-guess himself over and over and over and over and over and over again.